Good news, well, for me, anyway! Mither and Pop are coming to visit for a few days! They are coming tomorrow and I really should be cleaning house right now. I am going to have to get high behind here shortly. Plus! Nana will help me come to a firm decision about what color to paint the front door. 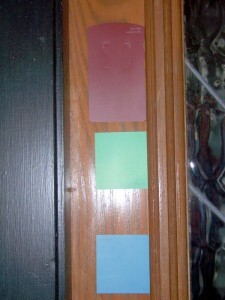 Here are more picture’s of paint swatches just to further confuse everybody. I have been picking up more colors every time I run out with Lisa, (the friend who’s having remodeling work done and is spending a substantial amount of time at home improvement and paint stores). We had lunch today while the caregiver provider was here with H and stopped at Sherwin Williams on the way home. 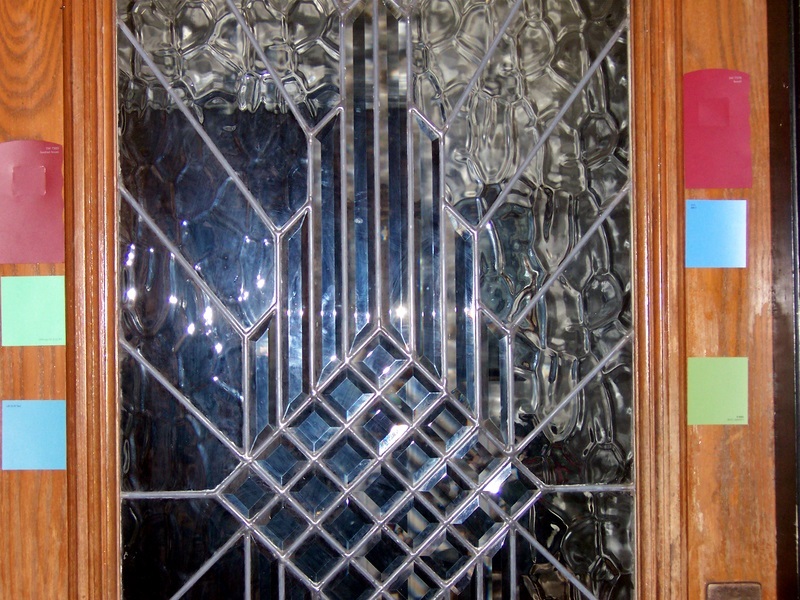 I’ll say one thing for the expensive paint people… they have bigger paint chips. Home Depot’s are smaller and Walmart’s are even smaller. 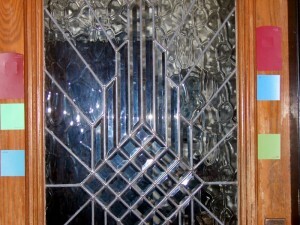 Here are the ones on the other side of the door. So what if the neighbours have a red door? Red is a good feng shui colour. Wait – I missed something. 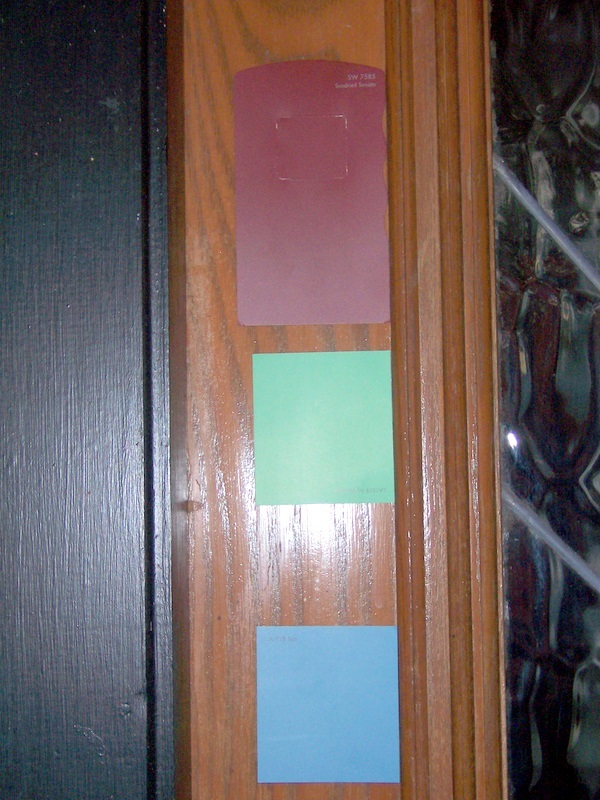 What color is the rest of your house? I like the RED, but I like the bottom one on the right, as well. But why do you want to paint over the wood? If you’re going to paint it (and I have to say I like the idea of stripping and varnishing it), I vote with the red on the left. The one on the right is a little too pinkish, I think. My first choice is a honey colored varnish. If you MUST paint, I vote RED! Good luck with the front door thing. Ours needs redone and I’ve been too afraid to tackle it. Let me know how yours turns out and maybe I’ll jump on board. I’m going to go against everyone and say blue! 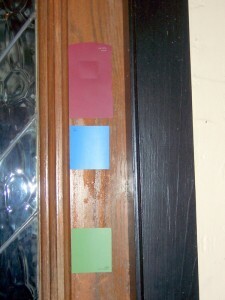 Just google the words “blue door” in Google Image to see how lovely blue doors can be. Do I see a grass-roots movement here? There are now 4 commentators (or commenters) that vote for the plain varnish. (Does that make it the varnished truth???) That is more than have voted for any other color. Gosh, it is such a burden being right all the time.